The Portable Antiquities Scheme records the finds the public bring in. The British Museum support it and the Finds Liason Officer sees thousands of objects a year. This talk illustrated some of the unique hoards found in Gloucestershire. One interesting find was a Bronze Age rapier found next to a river. It had been broken ritually and thrown in. The finds handed in are mainly coins, brooches and belt hooks. Many of the coins are Roman, some are very corroded and in a poor condition. The Emperors’ heads on the coins can date them and a study of the distribution of the coins can tell us how a site was used. At Worms Farm near Cirencester coins (Roman grots) were found and recorded. There followed a geophysical survey of the site following the finds. At Slimbridge, Glos., there had been no previous recorded Roman evidence until some finds came to light and a geophysical survey showed evidence of a Roman settlement. One of the most extraordinary finds was what became known as the Thornbury Hoard. In 2004 a Roman hoard was discovered in a fishpond on a 1960s housing estate. A house-owner was digging a fishpond in his back garden and discovered the coins in a pot. 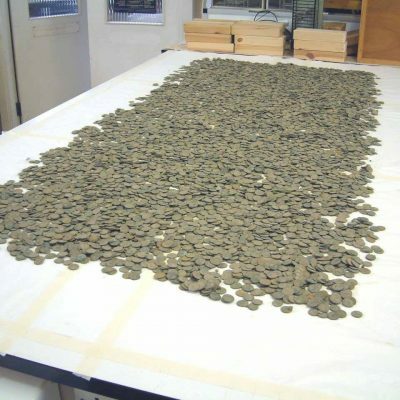 He dug it out and found 11,460 coins dating from AD270 – 340. 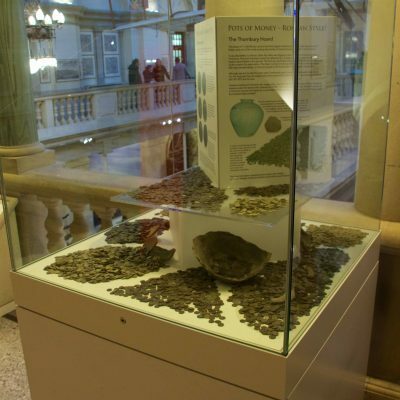 The coins were taken to Bristol City Museum & Art Gallery for conservation where they were put into an alcohol solution to allow them to dry out. Some of the coins belong to the period of Constantine and had Constantinople on them, but no Emperor’s head was depicted. One of them had a winged Victory standing on a boat and another had Romulus and Remus the she-wolf dated to AD340. A later coin depicted a Roman soldier on a horse spearing a barbarian with the legend “Happy times restored”. This was a propaganda coin. There were also Mint marks depicted and this showed that the coins had come from all over the Roman Empire and the Mediterranean, including Trier and Lyons. The Toenail Hoard, Forest of Dean, so named because it consists of 480 clippings from coins that resemble toenails. The coins date from Charles I and Elizabeth I and are silver. The clippings are very thin silver that could have been cut with scissors. Some of the coins are clipped. Clipping coins reduces eth value of the coin and can affect the overall economy. There were regular re-mints to get rid of the clipped coins. Clipping was regarded as high treason and people could be hanged, drawn and quartered as a result. Women could be burned at the stake. Everyone that was tried would be executed. The Gloucester Dog Hoard was found in 2017 and the group of finds from this hoard suggests they may have come from a (previously unknown) temple site. The hoard was found 1 metre below the surface in a big ball. It came out in layers and filled two sacks. It consisted of copper alloy strips, like those from a box band fitting, that were folded up. There were studs for table fittings, ornate handles, escutcheons (loops on either side of a bowl), the base of a statue stand, a bronze human face, bronze statue fragments from a large size statue and a bronze dog, that measures 30cms. Comparing these finds from the Lydney Temple site, there are a number of dogs from Lydney, but they are tiny, compared with the one from Gloucester. A licking dog is an example of a healing statue. The Gloucester dog is standing, with ears upright and it has teeth and a panting tongue. Its eyes look up and it has two holes in its body, which suggests that another statue was standing by it, for example its master. There is decoration on its shoulders and it has holes in its paws, which shows it may have been pinned to a base. Is it associated with the Roman god Diana? The statue fragments have drapery on them, i.e. folded cloth. It is noted that statues of Diana also have drapery, therefore the fragments may be a statue of Diana. There were four fragments of an inscribed copper alloy plaque which could suggest that a corporate body is paying for the statue and the inscription dedicates a patron. (…) V? MCONLA (….). Other religious items include the copper alloy face, which could be a spirit of the woodland face. The escutcheons and the handles may be from an ornate ceremonial bowl. Dating the hoard is from a spoon, a buckle and a coin dated to the mid 4th Century. 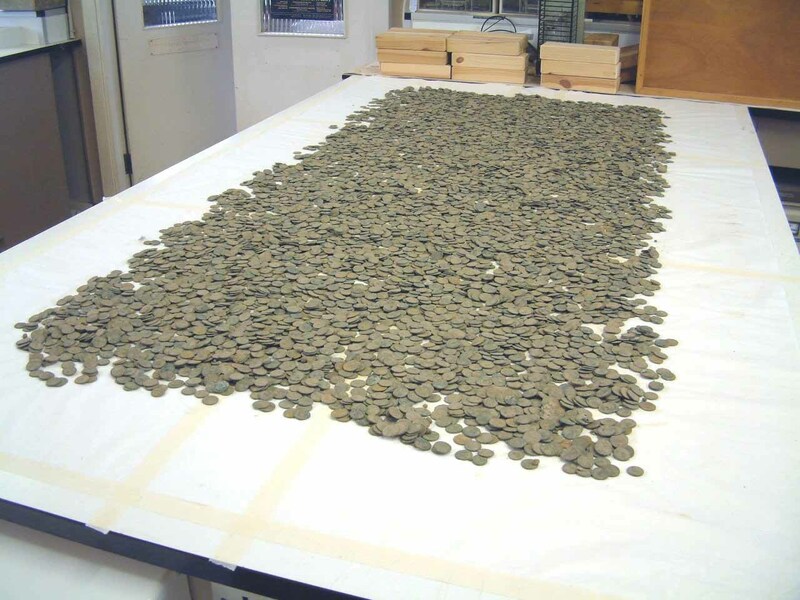 The interpretation of the finds suggests it was a founder’s hoard that could have come from several locations. The amount of religious objects within it suggests it could have come from a temple associated with Diana. It suggests that Christianity could be appearing at this time and destroying pagan objects. Also found within the hoard is bronze slag from an iron furnace nearby. A princely Saxon burial was found in the Cotswolds in 2016, that contained a silver Saxon buckle, with knot-work in the decoration. The buckle is very thick, suggesting it belonged to someone of high status. Nearby was found parts of a 6th Century Saxon sword of silver gilt. This was unheard of in Gloucestershire. Subsequent excavation of a grave found a sword, shield boss, leg bones, a copper alloy sheet and an Anglo-Saxon hanging bowl. There was glass in the grave, i.e. from a rare Frankish cone beaker dated to the 6th Century. The grave was of a juvenile 8-12 years old. It is unusual for one so young to be buried with such rich grave goods – was he a prince? Geophysical survey showed lots of activity in the field, so this could be an Anglo-Saxon cemetery. A circular area on the site may be a Bronze Age barrow, like that at Barrow Clump. This was dug by Wessex Archaeology and Operation Nightingale. This feature will be dug in the Summer also with Operation Nightingale (http://www.breakinggroundheritage.org.uk/operation-nightingale). 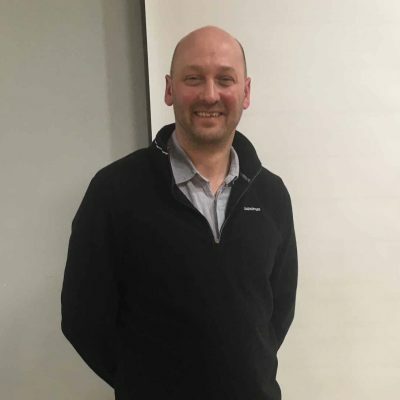 Many thanks to Kurt for such a fascinating and interesting talk.